The location was at a 7/11 in Tyson's Corner, Virginia . The "Take It !" was in being in line behind a "substantial" fellow that was at the cashier stand and was ordering some additional entree items from the hot dog gourmet rolling warmer to complement this beverage and dessert display. 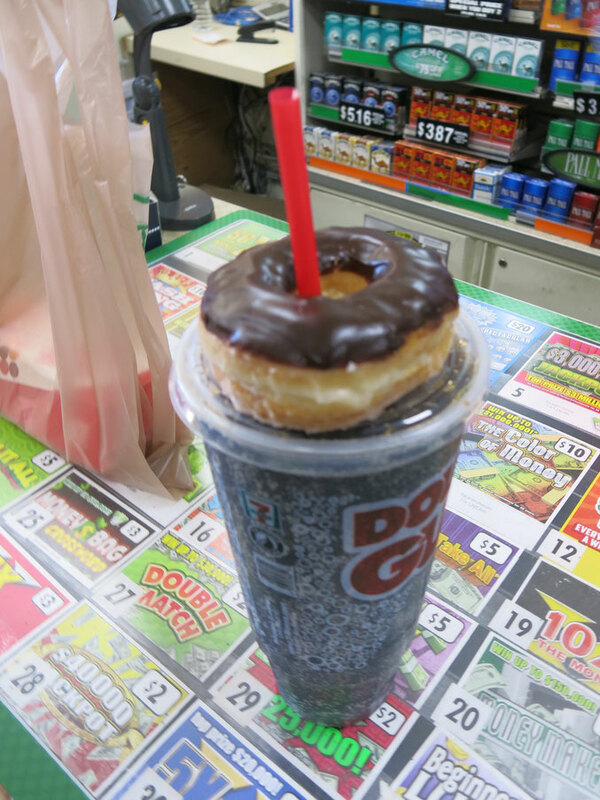 I asked if he minded if I took a photo of this very cool demonstration of anchoring the doughnut to the soft drink and was given the "go ahead." He told me that he had seen this done in San Francisco some years ago and had decided to use the technique for himself. The rest of his order arrived and we bade each other farewell. I had gone into the establishment to buy a newspaper to read while having a flat fixed, and walked out with only the newspaper - but renewed resolve to lose weight. After the tire was fixed (in shorter time than expected) we made our way down the road, with me no longer involved in the usual munchies that accompanies the wind up of the job. The After Take: This morning the scale was just a smidgen less than yesterday. One never knows where convincing inspiration may come from - lol - but when it shows up - Please take it. Wishing everyone a great day filled with achieved resolves. Heh, I wonder if he got that from me. I am in San Francisco and I have been doing that for decades. Wouldn't that be an interesting coincidence. And now I can tell people where I learned this technique. Im gonna start doin this. I like the political correctness of refering to him as a "substantial" fellow.....I chuckled at that. Im pretty sure I have seen people do this too....There was a guy at my school that bought 2 a day and used his finger to carry them around.